This is a brief outline of one of the themes of a presentaton I gave with Gustav Bergquist at DCD Zettastructure in London on 8 November 2017. [LONDON 8 November 2017] Adopting an off-grid strategy is tempting. But going off-grid is typically counter-productive, particularly for highly efficient hyperscale data centers, both financially and environmentally. An on-grid strategy has the potential to beat an off-grid strategy financially, technically and environmentally both in the short and long term. First, the on-grid strategy is a necessity for realizing financially attractive scale economies in input markets. It is straightforward that the average cost of power generation in hydro and wind is reduced as the plants can be built at rational scale. Less straightforward is the advantage that a pool of intermittent energy production spread over a large geographically area tends to have more predictable combined output than any single generator, which reduces the need for balancing resources. Second, related to the advantage of scale economies in renewable power generation is the advantage of scale in heat recovery. Connecting the data center to a large district energy system has the advantage that the data center can be built at cost-efficient hyperscale while still allowing commercially motivated heat recovery. Connecting to a large system for heat recovery helps matching demand and supply to greater extent and at lower cost. Third, an on-grid strategy relies heavily on competition between suppliers. In jurisdictions, such as the Scandinavian countries, where distribution and production are unbundled – with the former being a regulated while the latter is an unregulated market – each producer is small relative to the market despite scale economies in generation. As a result, data centers have both choice and attractive prices. 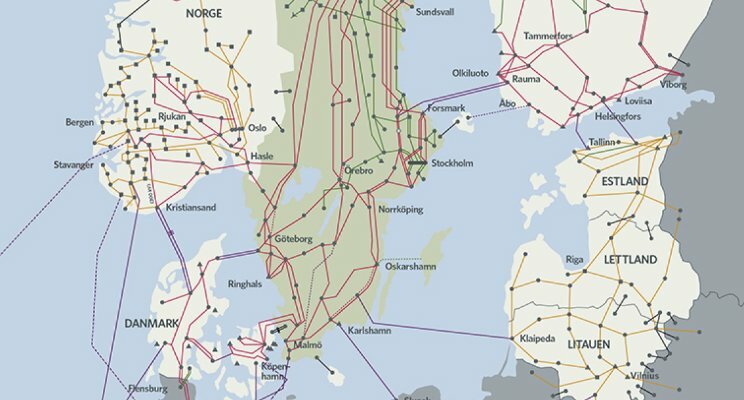 Fourth, strong and well-built energy infrastructure networks make the world smaller and introduce geographical flexibility. Rather than choosing a location for off-grid generation or a site in proximity of renewable energy production (e.g. a hydro plant or wind farm), the Nordic power market is available to customers across all of Scandinavia. This permits data centers in cities, most notably Stockholm, to combine hydro/wind, with commercial energy recycling, abundant supply of technical expertise and very competitive fiber networks. Connecting a data center to energy infrastructure is associated with several costs. The most important being the dependency it creates, both financially and technically, between the data center and the owner of the infrastructure. Moreover, connecting to a vast network adds complexity and an informational challenge as the status and operations of the system become less transparent. Finally, the direct cost (i.e. connection fees and usage tariffs) typically have a damping effect on the utility customer’s enthusiasm to stay connected. The basis for value creation of on-grid solutions is a close and productive relationship between utilities – power grid and district energy companies – and data centers. In practice, it requires a business-oriented approach that recognizes the need for open dialogue (to identify common interests and solutions), interdependence (for joint optimization and capital savings) and speed (capturing opportunities in dynamic and competitive markets).